07-Ghost was published in English by VIZ Media from November 13, 2012 to July 14, 2015. A 9-volume bunkoban edition was published in Japan from July 25, 2015 to March 25, 2016. The last bunkoban volume includes the final chapter of the series, Kapitel 100: Hallelujah. I've watched the anime, and I was hoping that they go for a second season, however, it didn't happen, so I ended up reading the manga AND!!... I wasn't disappointed... I love love love love it!!! It tells the story of Teito Klein, his perseverance to find his true self, and his bravery to unlock his sealed memories. The story has a lot of characters, and you get to love each one of them, even if they only took a small part in the manga. Each one of them played a significant role in Teito's past and present life. The good thing about supporting characters is that, you get to remember their own story, you'll get to understand how and why they ended up that way. Friendship and loyalty, are seen throughout the story, I nearly cried when Mikage died. He was reincarnated later on in a manner wherein he can still help Teito, and remain by his side. Frau's and Teito's funny antics, are like a breath of fresh air in the story, you get to smirk every once in a while. The ending of the manga, was a bit of a disappointment, it was delivered in a favorable manner, however, I just wish that Teito returned as Teito himself, and not a reincarnation, which, I know is impossible, because he did go to the Land of Seele, which is like entering death's door, but the great part there is, he got his mother and paternal uncle back after how many years. 3 years after its completion, I still find myself inexplicably mesmerized by the epic tale that is 07 Ghost. It's a tale about the rise and fall of kingdoms - about power struggles and political squabbles. But while the military backdrop and history of the land are beautifully carved, 07 Ghost is not a warstory at all. Rather, at it's core, 07 Ghost is a story about accepting all that life has to offer. It's about having the heart to appreciate another's act of kindness. It's about having the strength to move on when bad things happen. The battle mechanics in the story reinforce this. Characters use an energy called "zaiphon" - which conveys the feelings of the user. Although there are different types of zaiphon that are loosely related to the personalities of each character, at the fundamental level, everyone's zaiphon is of the same quality - it is the strength of the user's mentality that determines the zaiphon's strength. The main character, Teito Klein, is crafted brilliantly. He starts off without the least bit of appeal, an amnesiac with childish tendencies, who mopes about his circumstances all day, but he noticeably grows through the relationships and connections he builds throughout the series, developing a strong appreciation for the world, his friends, and even his enemies, until he eventually becoming a charismatic leader you'll have difficulty taking your eyes off of. It's amazing to watch his journey come full circle through the series. Yes, it's a cast of pretty boys. Yes, it's cliche as fudge. Yes, the action scenes are lackluster. But by the end of it, I hope you'll agree that 07 Ghost is so much more than that. Set in a fantasy world the story revolves around Teito Klein, the orphaned slave boy who became a top student of the rival empire’s military academy. With the unexpected turn of events, Teito is an escaping convict who is being pursued by the military of Barsburg Empire. He receives refuge in the church at District 7. This church according to the legends is protected by 7 Ghosts. As long as Teito stays within the church, the military of Barsburg cannot get their hands on him due to District 7’s law of sanctuary. As the story develops we come to know that there are two powerful stones – Eyes of Raphael and Eyes of Mikhail. The royal family of Kingdom of Raggs possessed the Eyes of Mikhail while the Eyes of Raphael was held by Barsburg Empire. Several years ago, the Barsburg Empire had broken a pact and decimated the Kingdom of Raggs to seize the Eyes of Mikhail. 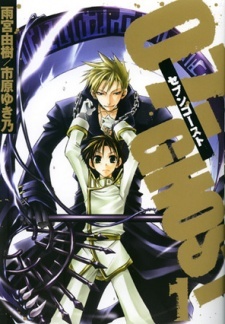 Teito is the last descendant of the royal family of Kingdom of Raggs, and possesses the Eyes of Mikhail without his knowledge.With his best friend Mikage now dead, the military after his life and Kor after his soul, Teito needs to unlock the mysteries of his past with the help of 7 Ghosts. The plot seemed to be complex with a lot of characters in play. It is blend of Magic, Religion, Military, Church, Friendship, and Revenge. Readers need to go through the story slowly and steadily to enjoy it. I recommend this to readers who are 18+ due to the complex nature of the plot. This is a wonderful manga that I think has enough action to appeal to some shounen fans as well as those (like me!) who love anything supernatural with a complex storyline and gorgeous pretty men. It’s not explicitly shounen ai I don’t think but there’s plenty there for the boys-love fans to read into. I get majorly excited whenever there’s a cool beautiful baddie and we get one entering the frame pretty much straightaway - and then the plot thickens with a sometimes quite bewildering complex array of characters, with multiple motivations and alliances. I really enjoyed the fantasy world the mangaka creates – it’s quite involved and intricate and yep you might have to find yourself taking notes in order to work out what’s going on ☺ Really great and I was sorry to come to the end.